This kitchen is so small and crowded that I have the microwave up there now because I hardly ever use it and I don’t have space for it anywhere else. 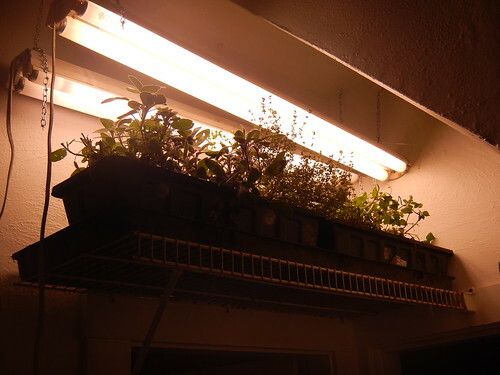 That means I can’t put my herbs up there, though. Our bathroom is right next to the kitchen and has very high ceilings. (Seriously. This kitchen is tiny and has four doors in it! I covered up one with cabinets, still, three doors!) So right above the doorway in the bathroom Frank put a shelf to hold four window boxes and hung lights above them. My theory is that it’s close enough to the kitchen that it won’t take long to snip what I need for a meal. He put the lights on a time, turning on at 6 a.m. and off at 8 p.m. We shouldn’t forget to water them because we’ll be in there often enough and water is easy to get to them. I trimmed everything up before we put them on the shelf – it was a jungle of herby goodness. They did really well out in the garden this year. I planted them all through black plastic, which saved them from the weedy mess that I had to deal with in the rest of the garden. They didn’t seem bothered by the lack of sun or excessive rain we had. 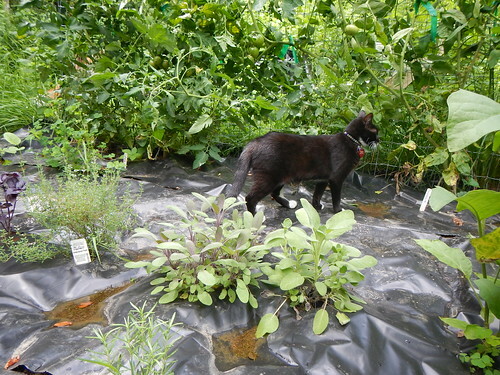 So Frank dug up some oregano, sage, thyme, which should do fine indoors being transplanted. He tried to get the sorrel, but it has a taproot, so probably won’t make it. I’m starting chives, basil and cilantro from seed. They hate being transplanted. 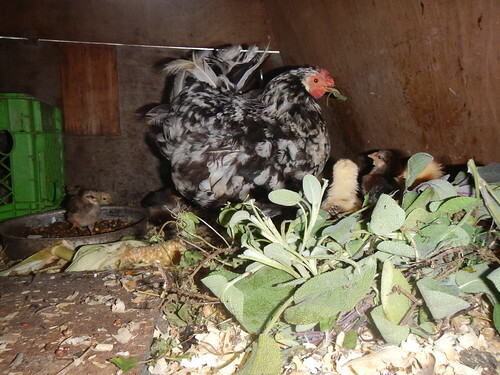 I gave the clippings to the Icelandic hen and her chicks that I’m still keeping cooped up. She is struggling with her brood if I let them out. I guess 14 is just too many for her. They are doing well with a little bit of ground under the coop, and a ramp up, but if I let them out, she loses half of them almost right away. I’m hoping that giving them another few weeks cooped up will be enough. I don’t know why they scatter so quickly and don’t grok following her around like chicks usually do. Yesterday, I thought maybe they’d gotten out somehow because it sounded like someone was torturing the chicks. No, she was just trying to teach them to go up and down the ramp. Half would stay behind and scream bloody murder before they’d figure it out. Up and down, up and down, all morning long. It was quite funny to see other hens, both chickens and turkeys, come over to see what the problem was. Hey, lady, get your kids to stop making so much noise! It’s not a very good video because I couldn’t get the right angle. But you can see some of the chicks jumping down in the beginning and can hear all the ruckus. And at the very end, a turkey looking in from the side to see what the heck the problem is. Big bunch of drama queens! This entry was posted in Basil, Chives, cilantro, Herbs, Rosemary. Bookmark the permalink. Post a comment or leave a trackback: Trackback URL.